Our family had a wonderful time in Austin this past Memorial Day weekend. We started out leaving immediately after I got off work on Friday for the drive to Austin from the DFW area. Richard picked me up from work and we headed south around 5:30 pm Friday night. We thought we were making great time using the new toll road cutting south through the middle of the metro plex until we were about to get onto I-35W down by Burleson after stopping at a drive thru window to get the girls some oh-so-healthy McDonald's for dinner. BAM! Lightening, high winds, dark skies and oh, did I mention the tornado watch? Yes, I discovered we were in a tornado watch when I scrambled to the weather app on my iPhone. Great. We were loaded down with our whole family and hauling a U-haul trailer full of baby stuff down to Austin in a severe thunderstorm. We managed to make it to our hotel in Austin around 11:30pm after the packed commute down I-35. Still not bad considering much of the I-35 commute was between 10-45 miles per hour. We made up some serious time when we hit the new toll road around Austin. The rain had lightened up and did I metion that the speed limit on this new road was 80 mph? YES! After checking in and carrying the girls up to our room at the Staybridge Suites we needed to pull out the sleeper sofa for the girls. I was using points for the three nights at Staybridge Suites so we could only get a studio suite. Of course as soon as we start pulling out the sleeper both of our girls became wide awake and bouncing off of the walls. Besides, they had had a good rest and nap in the Acadia. Ugh. Well, after settling in for the night we were able to finally get to sleep (Richard on the sleeper sofa with Brie and I on the bed with our oldest, Abby) around 12:30 am. Brie managed to wake us around 6:30am on Saturday morning all happy and energitic to start the day. We managed to access the free breakfast and slowly get moving. We made it to his brother's home in Kyle around 10:30am with the trailer full of baby stuff for them. Their new baby girl is due at the end of August. Richard and his brother Allen took the trailer to a U-Haul drop off to turn it in after unloading it. We then decided to hang out around their home and visit while the girls played with their cousins. It was a rainy day after all. We had fun when we got back to the hotel. The weather had broken for the rest of the afternoon and the girls wanted to hit the pool. We were the only patrons brave enought to hit the outdoor pool first. Let's just say that the pool was very cool, lol. But parents do crazy things for their children and ours needed to burn some energy off to be able to sleep for a big day on Sunday. Keep in mind that the naptime is usually to the wayside when our girls are excited about activities. Everything was fine until Brie climbed out of the pool's edge and backed away slowly with that concentrated look on her face...."Brie, do you need to go to the potty?" I cautiously ask. "I poop", was her response. Ugh! Poop in the bathing suit is the worst! I couldn't believe it. I had just asked her if she need to go to the potty a minute earlier before helping her to the edge of the pool. She smiles and slowly heads towards the chair with the towel. As she turns I see the turtle head like structure protruding in her swim bottoms. I'm thankful she at least waited until after she got out of the water.....off to the room we go for clean up while daddy and Abby continue their fun adventures in the pool. 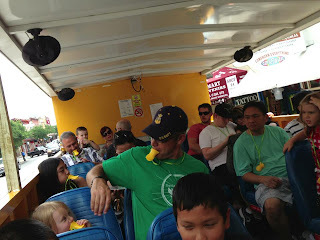 The next day we rode the Duck Tour Adventures from 6th street in downtown Austin. It was fun. The girls loved it when the pirate ship painted tour bus turned into a boat and we entered lake Austin. I had no idea that so many movie stars were starting to call Austin home now either. Wow! We decided not to go see the bats afterwards due to the rainy and overcast weather. There will always be another trip to go see the largest urban bat colony in the world come out at dusk for their nightly feedings. We figured that the grassy areas for viewing would have been too muddy. We opted for a Mexican dinner with all eight of our family party down on 6th street. We headed back to the hotel for a little rest prior to heading over to our family's home for movie night. The girls absolutely had a blast playing and visiting with their cousins. We headed back home on Monday morning and I was happy to say we beat most of the holiday traffic and rain on the trip back. We love visiting Austin. Next time we'll have to go see the bats and I want to take a trip to the farmer's market on Saturday morning. There's so much to do there that we'll just have to visit more often to get it all in.